Jamaica, 1962 – the setting for brand new play, Red Snapper by Liz Mytton which is taking to the B2 stage this March. Today, Janet Vaughan revealed her set design (pictured below) which brings to life an island on the verge of independence and filled with the excitement of providing the setting for James Bond movie Dr No. The play follows five women and their husbands on the council, this is a time of mixed fortunes and uncertainty, as personal and political tensions simmer against a backdrop of mass emigration and unrest. With local people increasingly excluded from the beaches, so as not to ruin the view for the growing tourist trade, a planned visit from nearby Cuba’s communist leader, Fidel Castro, has the islanders in a spin. Will the high profile visitor bring further prestige and glamour, or will his presence incite the island’s downtrodden fishing community to rise up? As the pressure builds, family secrets and long-held resentments bubble to the surface – and when the councillors’ wives meet to plan a welcome meal for Castro, it’s not just the cooking pots that are in danger of boiling over. The main feature of Janet’s design is the wood panelling that sprials around the stage to form a boardwalk, where most of the action will take place. This set has also been carefully put together to represent several locations featured in the play. 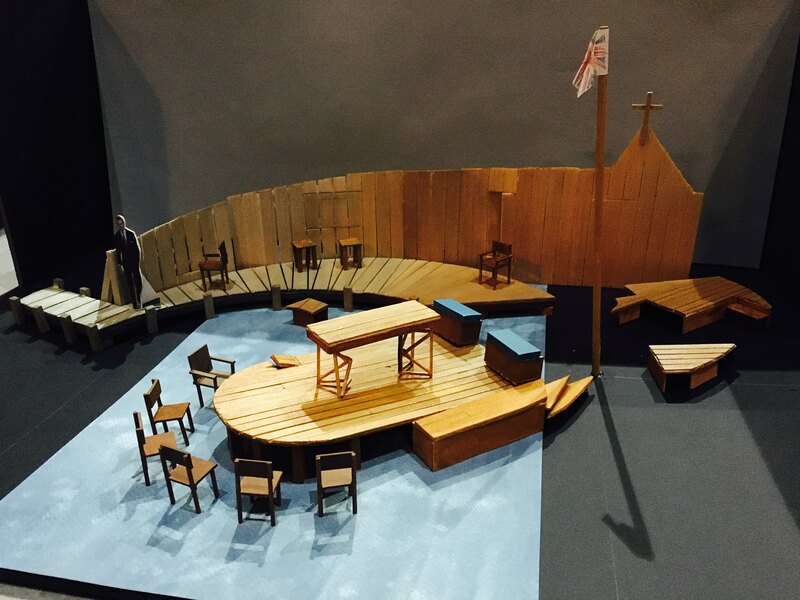 For example, during the play, sections of the wood panelling will be removed leaving a central island that acts as both a boat atop a painted blue sea and the table where the council meetings are held. Once lit with warm, tropical colours, the back wall will provide the perfect Caribbean sky looking out to Cuba on the northern coast of Jamaica. Red Snapper will be performed in ‘thrust’ which means the audience will be seated around three sides of the stage and will become fully immersed in the play. Having put together what’s called a ‘model box’ version of the set, Janet’s design will now go into production at the Belgrade’s set building workshops at Red Lane. Once finished, the set will be brought back to the theatre and fitted into our intimate B2 auditorium. Tickets are available now priced from just £8.75 by calling our friendly Box Office team on 024 7655 3055 or book online. Red Snapper runs from Sat 5 – Sat 19 Mar.